Cyberstud Poker is a game of poker which is conducted not between players, but between the player and the house. It is conceived and constructed by Microgaming, the leader in the development of gaming software worldwide. The game is played with an Ante which is on the table until the player calls or folds. The dealer gets one card, followed by a decision by the player, the nature of which depends what chance the player thinks he has of beating the dealer. The objective is simple - to come up with the strongest hand. 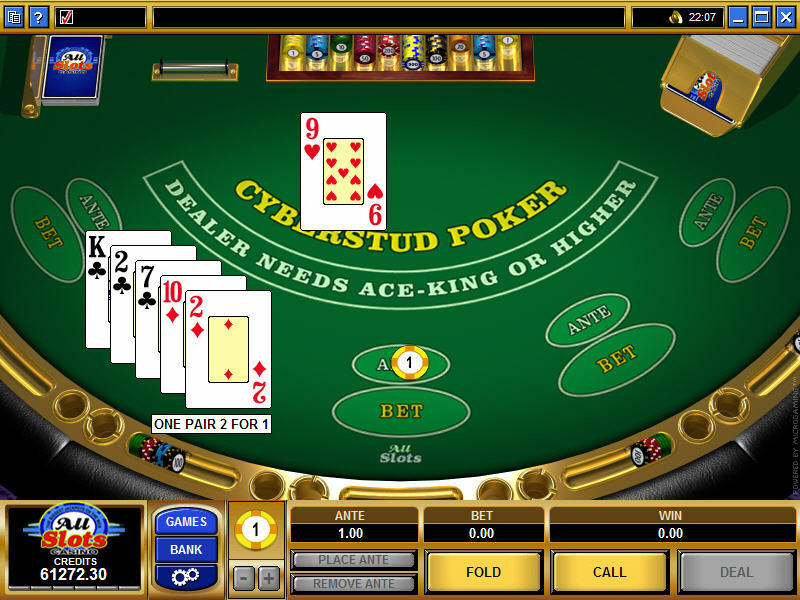 Cyberstud Poker bears a resemblance to a blackjack game, in terms of the actual table layout. There are five spaces in front of dealer station. The player puts up a bet in the form of an ante, and the cards are dealt. Instead of being dealt two cards, as would be the case in blackjack, here the player would get five cards. The dealer has a card that is face-up. At that point in time the player then has the option of making an additional bet that is placed in the "Bet" oval. This is a "Call," and it is twice the amount of the ante bet. Then the dealer draws his own hand, and must have at least an Ace-King combination. Otherwise, the player wins. The payout table is readily available, and within the Help files there are graphic descriptions of each kind of hand that offers a payoff - the Royal Flush, Straight Flush, Four of a Kind, Full House, Flush, Straight, Three of a Kind, Two Pairs, One Pair and Ace-King. Interested in reading more detailed information about Microgaming Cyber Stud Poker? If so Click Here for more details.